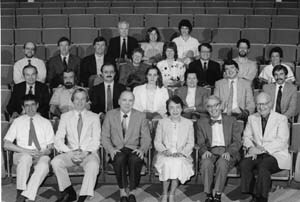 Most of the Liberal Arts Faculty and Arts Faculty and Emeriti in the Sesquicentennial Year, 1987. Left to right: Row 1: Warren, Beatty, Ross, Youse, Cook, Mayer, Gibson, Mecum, Rosser, Bottoms, Falco. Row 2: James George, Sprague, Raymond, McFarland, Fuller, Kissinger, Teeguarden, Thomas, Gass, Dudley, Manickam, V. Williams, Morrill. Row 3: W. Wilson, Yochum, Elrod, J. McCall, Abel, Metzger, Hazel, Smogor, Kannowski, Gardsbane, Garriott, Gooch. 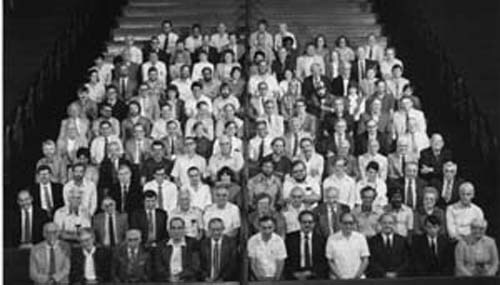 Row 4: White, Serlin, Calvert, Mays, Gammon, D. Smith, Schlotterbeck, Dittmer, Farber, R. Harvey, E. McCall, Lovelace. Row 5: Phillips, Stark, Eccles, Emery, M. Catanese, Brooks, Mourouzis, Erdmann, Wright, Henninger, Turk. Row 6: Burkett, Hagaman, Moore, Garrett, Glausser, Soster, Newton, Schwartz, Kelly, Edward Ypma, J. Wilson. Row 7: Simmons, Shahin, Carlson, Wichser, Lemon, W. Field, Sutton, Price, M. Johnson, C. Cornell, L. Cornell, Steinberg. Row 8: Jagger, Evans, Hanson, Raines, A. Catanese, Coulont-Henderson, J. Rambo, A. Rambo, Eigenbrodt, Gustavsson, Davis, Huffman. Row 9: Ryujin, Opdahl, Goodson, Biggs, Weaver, Leverenz, Erndl, E. Welliver, G. Welliver, S. J. Williams, C. Williams, Barnhart. Row 10: B. Steele, Mizer, Raybern, MacPhail, Anderson, W. Gilmer, Brown, Steinson, Chandler, Baughman. Row 11: Mannon, Shetty Curry, D. Field, Eleanor Ypma. Row 3: Kessler, Drew, Hart. 1986-87. 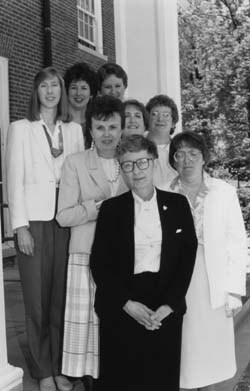 Left to right: Row 1: C. Johnson, D. Rizner, R. Grocock, M. Carkeek, C. Grubb, D. Hanna. President Robert G. Bottoms entered upon his new duties at the outset of the year-long celebration of the 150th anniversary of the founding of Indiana Asbury-DePauw University. The festivities began with a formal opening convocation on September 5 addressed by President Paul Hardin of Drew University. Two weeks later the university hosted 150 descendants of the 25 original members of the board of trustees, who joined the student body, faculty and administration and hundreds of residents of Greencastle and Putnam County in celebrating Community Day with a chapel program in Meharry Hall and a picnic in Bowman Park. The following Friday the history department presented a special convocation on DePauw's historical heritage, and a panel of local alumni reminisced about student life in earlier decades in an "Evening of Nostalgia." On Saturday morning, Barbara Blakemore '46, Vernon Jordan '57, and Joseph Allen '59 spoke eloquently about the value of a liberal arts education before a Parents' Weekend audience in Kresge Auditorium. Chancellor Emeritus Alexander Heard of Vanderbilt University gave the principal address at the formal inauguration of President Bottoms in a Friday morning convocation at the beginning of Old Gold Weekend in October. Other participants in the ceremony were Chancellor Richard Rosser, Professor Arthur Carkeek of the Music School representing the DePauw faculty, United Methodist Bishop Leroy C. Hodapp, and the outgoing chairman of the board of trustees, Eugene L. Delves. The newly installed chairman of the board, Robert R. Frederick, presented the presidential medallion to Bottoms, who made a brief inaugural address. That evening the university instituted the DePauw Athletic Hall of Fame, naming 25 former students and coaches as its first members. On Saturday morning Chancellor Rosser presided over the dedication of the William Weston Clarke Emison Art Center, renamed to honor the contributions of the Emison family to the university over four generations. Professor Emeritus Jerome Hixson, former Dean Robert Farber, and Athletic Director Tom Mont shared the podium at the traditional Old Gold chapel in Meharry Hall. A gala musical performance by the DePauw Symphony Orchestra and the DePauw Concert Choir and Festival Choir concluded the festive weekend, featuring the world premiere of a specially commissioned sesquicentennial composition by Paul Whear '48 entitled "Old Gold -a Celebration" and appearances by opera singer Pam Coburn '74 and guest conductor Joseph Flummerfelt '58. A series of special events extended throughout the academic year, including lectures and symposia on scientific and public policy issues. Honorary degrees were awarded to five women religious leaders representing a broad spectrum of faith and action, Roman Catholic, Protestant, and Jewish. In addition programs were devoted to remembering the social idealism of the 1960s, Black Cultural Week, Women's Week, and a Week of the Arts. Three prominent ministers delivered sermons for "A Great Day of Preaching." DePauw also formally inaugurated the Center for Contemporary Media with addresses and panel discussions by noted journalists. 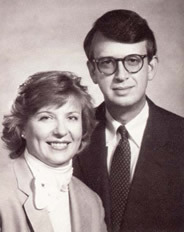 The sesquicentennial celebration was brought to a grand conclusion, along with the sesquicentennial financial campaign, on Alumni Weekend in June 1987, with a succession of events culminating in an impressive display of fireworks in Bowman Park. In his inaugural address President Bottoms set forth three important initiatives for his administration: (1) to bring about greater diversity in the student body, faculty and administrative staff, and the curriculum; (2) to give renewed emphasis to science education; and (3) to provide moral leadership in an increasingly secularized environment. 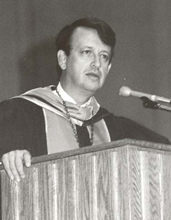 With wide support from the DePauw constituency, he began implementation of these goals, both by organizing task forces to plan appropriate action and by concrete steps such as the establishment of a new minority scholarship program and a policy of increased representation of women and minorities on the university staff.